Holy Week is a beautiful mosaic – a work of liturgical art with each piece giving shape to the greatest Love story ever told. It is best understood when experienced in its entirety. St. Paul’s invites you to participate in each of the services listed below as together we enter into the mystery of Holy Week. Palm Sunday begins with the telling of the story of Jesus’ triumphant entrance into Jerusalem. The palm boughs are handed out and blessed and a procession begins into the church singing “All Glory Laud and Honor, to Thee Redeemer King”. Once inside, the mood changes from “Hosanna to the King of Kings” to “Crucify Him, Crucify Him” as the Passion narrative is told. Maundy Thursday we gather for a silent soup supper while lessons are read and music is played. It is a time to simply listen, to take in the Good News of God’s redeeming grace. Following the supper we will gather for the last Holy Eucharist of Lent. It is a time that we remember Jesus’ final “mandate” that we “love one another as he has loved us.” Additional Bread is consecrated and reserved for Communion on Good Friday. (Because of Christ’s death on Friday, there cannot be any consecration of bread and wine after Maundy Thursday until the Great Vigil of Easter on Saturday evening.) The congregation is then invited to come forward to have their feet washed. All may…none must. 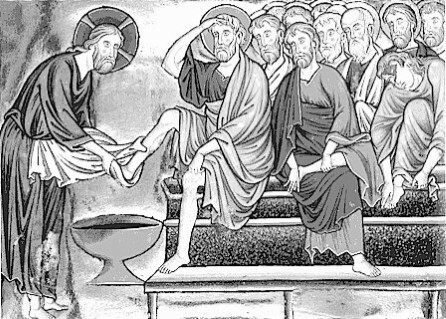 It is done in remembrance of Jesus’ washing of his disciples’ feet as a sign that we too are called to serve others in His name. The service ends with the Solemn Stripping of the Altar. All adornment in the church is taken away in silence. The altar is stripped and washed…as though preparing the tomb. The last gesture is to remove the presence of Christ from the tabernacle and place the consecrated Bread on the altar in the Transept. The eternal candle is extinguished…the door to the tabernacle is left open and empty. A vigil is kept in silence at the altar of repose. The silence continues until 9:00pm and the night concludes with praying the monastic office of compline. 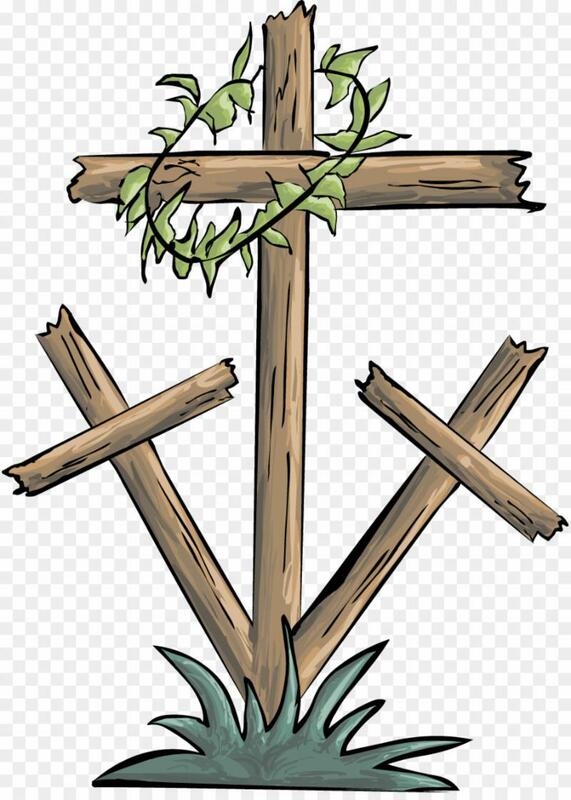 Good Friday is the day we remember Christ’s passion and death upon the cross for our salvation. It is a time to focus on Jesus’ final moments and death upon the cross. The gathered receive Communion from the Reserved Sacrament. The Consecrated Bread from the Maundy Thursday service is brought back from the Altar of Repose and is prepared for distribution and all must be consumed. Because on this day we are remembering Christ’s death, no bread or wine can be consecrated. The faithful wait and watch. 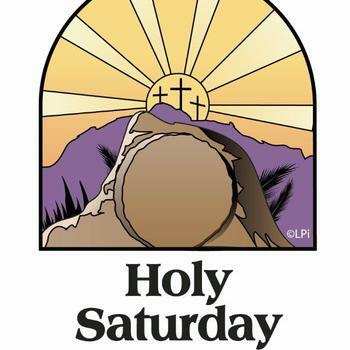 The Holy Saturday Liturgy of the Word begins at 10:00 Saturday morning. This service remembers Jesus’ descent to the dead. It is the affirmation that Jesus was and is in continual pursuit of all of God’s creation; even those who have looked God in the face and said NO…to preach to those the world deems beyond redemption! Isn’t it curious that Jesus chose to go to Hades before being reunited with his Father in Heaven? “What wondrous love is this, O my Soul? At 6 p.m. we gather to break the Lenten fast with a festive potluck dinner. Lent is over! The Good News of the Resurrection is about to break forth into our darkness. The Alleluia’s are about to return. At 8pm we gather in the parking area for the lighting of a New Fire and the Blessing and Lighting of the New Pascal (or Easter) Candle. The procession begins, the community gathers to hear the stories of God’s mighty and wondrous deeds from the Hebrew Scriptures. Stories of God’s activity in generations past are told as reminders of continual God’s faithfulness in our lives. 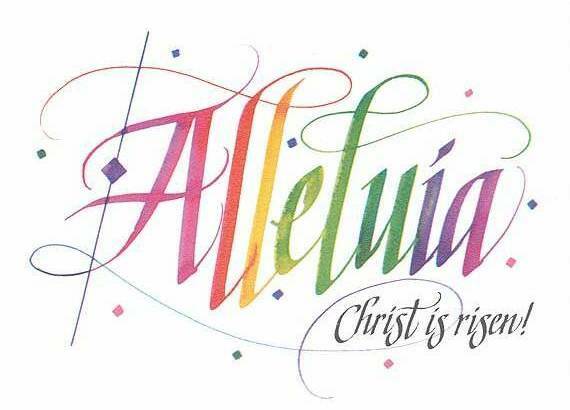 The Priest proclaims: “Alleluia, Christ is Risen” and the people respond, “The Lord is Risen Indeed, Alleluia”. The bells begin to ring. The sound of triumph is deafening. Alleluia’s abound! 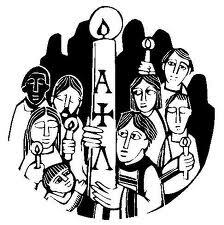 We remember the covenant we took at our baptism, joining our voices with those who are to become new Christians. The Eucharist returns, we are fed. It’s quite a journey. Take in as much of it as you can. We’re all on the learning curve when it comes to understanding God’s love in the gift of his Son. 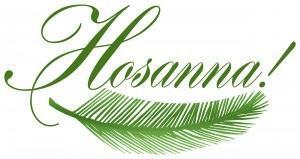 May God’s Spirit guide and direct your journey as you move from waiving palm branches to singing “Alleluia”. Please know that we are currently able to park between the ORANGE CONES and the curb. The best approach is to come south on 15th from I St. and then pull in between the cones to park. There are parking cards in the Sacristy and the Parish Hall that say: This Car Belongs to St. Paul’s. Please pick one up and put it on the dash of your car if you park in the coned off area.